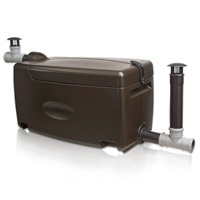 Greywater filters complete the water treatment needs of the home when waterless toilet are used. Greywater is the term used to describe water that comes from showers, sinks and appliances in a domestic setting. Water from toilets, called blackwater, is not included. Greywater contains soaps, detergents, hair and food scraps so it does not require as much treatment as waste water from a traditional setic system as it contains no faecal matter. Greywater is not nutrient rich like blackwater so closed system reed beds are not suitable. This is because the water it cannot provide a reed bed with enough nutrition. A greywater filter is a robust engineering solution to to greywater treatment. How do Greywater Filters work? The function of the greywater filter is to clean the greywater prior to it going to a soakaway. The greywater filter traps all the debris in the filter media. This media is easily changed over and composted. 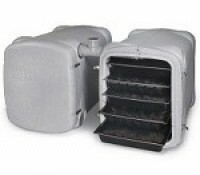 The filter media is organic so it can break down, unlike a sand or gravel filter which is harder to dispose of on site. Unlike a grease trap there is no standing water (tank) in the system so there is no potential for water stagnation if the building is not used for a period of time. Planning guidelines for greywater disposal vary depending on the local authority and the sensitivity of the site. Some require a filter some do not. In general the more protection you provide to the soakaway the longer it will last before clogging up. 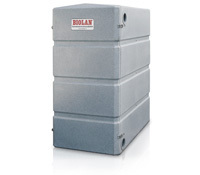 Biolan and Willa greywater filters trap items like food scraps, lint from clothes, grease, fats, hair and other debris from clogging up your infiltration area and contaminating your ground. All greywater filters supplied by Toilet Revolution use no electricity.